As the days approach, I find myself again more and more used to the whiskey I'm drinking, and with less insight to add. Hopefully that will change soon! That said, I'm also afraid I'm blowing my wad here a bit -- I have only a few more opened whiskeys on my shelf matching the ones available at the Derby, which means I'm going to have to start cracking open new bottles. What a shame, eh? Elijah Craig tastes a bit like demarara syrup or honey, particularly on the finish. There is a slight off note on the finish, a charcoal bittersweetness, balanced by some of the tastiest rye finish I've had. The whole whiskey is a bit corn-y, with a slightly thin ethanol smell. The demerara makes me really like it, but the heat and bitterness finish makes me unsatisfied. I still go by my general assessment that it is a really good introductory whiskey, particularly to the complexities of rye. I think the other flavor note I get is often described as eucalyptus -- spicy and evergreen smelling. That said, that's the flavor I get from a lot of Heaven Hill offerings, so I might just be expecting it. I used to be able to pick it out in blind testings; nowadays I'm not so sure my palate is calibrated well enough. There are 20 horses, max, in the Derby. There are often fewer -- horses get scratched all the time. It's appropriate that, 20 days until the 3030 Bourbon Week event, that I have a bourbon from Four Roses. The Derby is the Run of the Roses, after all, and Four Roses is a pretty fantastic distillery. In stark contrast to last night's bourbon, Blanton's, the nose on Four Roses' Small Batch is fantastic. I could sit and smell this whiskey for a while -- and it's not even as good as my memories of some of the premium whiskies Four Roses makes. In fact, the nose on this guy is good, but nowhere near the level of any of the Single Barrels -- and I had to cheat a little and pop the cork open on a (already-opened) bottle of 4R Single Barrel just to confirm that assumption. That said, the nose is a bit one-note; rye, oak, and vanilla are completely dominant. I'm a bit tired, so I'm going to make this review quick and sweet. The whiskey itself has a lovely taste, with some spice interplay, but continues to be a bit one-note. There's definitely some vanilla there, but with a sparkling spice note at the end exceeds Blanton's in intensity, if not in complexity. For a premium (mid-tier bourbon, this bottle is quite nice for the price. Rye, vanilla, a little honey, and oak are present in all parts of the drinking experience, and while the alcohol asserts itself, it never dominates. Four Roses SmB has a lovely bottle, with a raised rose, and that, plus some light heather/honey may make the drinker assume it is supposed to be a light introduction to whiskey, but that heavy rye finish always kicks back and reminds you you're having a mid-age bourbon. This is an easy-drinking whiskey, but while it is straightforward it's never shallow. The finish lingers just long enough. It lacks the value and burn of its younger/more mixed (Yellow Label) and heftier (single barrel) expressions, but the Small Batch, right now, strikes me as a great introduction to the distillery and bourbon in general. Certainly, I've won some scotch fans over with this bottle, and it does have a mild resemblance to a Speyside, swapping any peat for the common bourbon rye, corn, and vanilla, the first and third of which are in spades in tonight's drink. This is a tough review for me, since I'm going into it with... feelings. Maker's Mark is probably the perfect whiskey to introduce someone to the concept of whiskey with, as it is whiskey without a strong finish. The finish, as I've noted before, is why I love bourbon. However, it's also a tough thing to deal with if you haven't drank much hard booze and you're conditioned by tough-guy movies or whatever to believe that a strong finishing flavor is harsh. I was a right snotty young man a few years ago, the kind who couldn't help rolling his eyes at people who took a shot of Jack Daniels (probably the smoothest and blandest of American whiskeys) and declared it to be harsh. It wasn't a tough-guy judgement for me, like drinking terrible whiskey was a decade ago, but it was still an unfair one. All sorts of folks have been trained to believe that "smooth and easy" is desirable -- and why not? That's what a lot of folks are looking for in life, too -- things to just be smooth and easy, for once. That said, I'm not a cantankerous old man who insists that hardship always builds character, but I actually like a little roughness and difficulty in both my life and my whiskey. Maker's 46 launched at a time when I was knee-deep in my whiskey obsession, prior to Ontario opening up the floodgates a bit. Its marketing campaign was also a bit suspect -- Maker's claimed that it was the first time they offered an alternative to their standard product (Maker's marketing is based around consistency, holding up consistency as the highest sign of quality), which the late-80 dusty bottle of import Maker's 101 hidden in my whiskey closet proves wrong. I had lots of reasons to distrust Maker's at the time. The bottle of 46 I'm drinking from was from the first release to hit the shelves in Kentucky. I've heard newer bottlings of it are a little more balanced, but, hey, I drank a couple ounces from this when it came out and let it sit. Despite that, it has a reasonable kick -- 90 proof shines through without being harsh. It has the same hints of cinnamon in the taste that Maker's often has, and manages to expand upon them and let them linger. That said, there's not a ton here. It's tasty, but not interesting -- where the 4RSB I had last night was one-note, this is even less intriguing (an ambient ocean sound compared to the Ramones, maybe?). That said, it's a wheater, and they're relatively rare, with a lot of the same nice wheat-grain-notes that bourbon nerds like. If it was aged longer on top of more efficiently aged (the gimmick with this guy is they add additional wood staves to the barrel, to increase the surface area of oak affecting the aging white dog -- that's why they can't call it Straight Bourbon), it might be something really special. The higher proof really benefits the Maker's flavor profile; I would absolutely love to try some 101 or barrel proof of the current product, but they're so strapped for juice they tried to drop the proof of their base offering, so that seems like a pipe dream. My whiskey for September 12th: Blanton's. Taste is inextricably linked with our other senses, and, more importantly, our overall perceptive abilities. When we feel alert and interested, our tastes may change; in times of stress, some unfortunate sensitivities are heightened. In times of pleasure, things might overall "feel" better. Our ability to review situations is reflective of our mental state -- when I think back to my favorite meals, for example, they were often on happy occasions (birthday dinners, anniversaries, so on). It's a bit of a self-perpetuating conceit -- I often go to a nicer/more novel place because of a special event, but eating a meal when the moment already feels significant may already make the meal seem better than usual, pre-confirming my desire for things to be special. Later meals at the same places are typically enjoyable, but may not have lived up to that first experience, either because they were novel or because I was particularly receptive to positive feedback. One of my fondest memories in recent years is sitting and drinking Blanton's with my dad. Because of that, it's difficult to really review it completely objectively outside a blind tasting. After all, the situations I'm drinking bourbon these days -- exhausted, late at night after a bar shift, as my wife and the world sleep around me -- aren't exactly the perfect tasting scenarios. That said, Blanton's is good enough to lift my spirits. The nose is nothing to write home about, but when it hits my tongue, it reminds me of the lovely honeyed taste Scotch aficionados write about. The mouthfeel isn't exactly thick, but it's not really thin or anything. The final taste and finish is a thing of beauty, one of the great back-of-tongue flavors and finishes in the world of bourbon, and whisk(e)y in general. The finish is what brings me back to bourbon -- a peaty scotch has a lovely finish, but nothing matches a beefy bourbon finish, save for a really exceptional (and/or old) American rye. The wood gives so much to the back of the tongue and the lingering taste on the throat. I'm trying to avoid looking up outside information as I drink these whiskeys, but, unless my memory fails me, I think that Blanton's is part of the higher rye/lower corn mashbill that BT uses for some of its bourbons. That rye definitely kicks in that "back of tongue" grain interplay I keep harping about.When I want to tell people about the crazy tingling and "dancing-grain" tastes I get in some bourbons, I usually use the Weller bourbons as a point of reference. However, this freshly-cracked bottle of Blanton's is giving me the same thing, but with a rye profile. While Van Winkle is no doubt a great distiller, Blanton's (and Stagg) are the big arguments for how Harlan's mainline BT stuff can go toe-to-toe with the hyped Pappy (and its little bro Weller). I'm trying avoid dipping too much into my stash of rare (mostly-US-only) bourbons, to keep mostly to whiskies that will be available at the Derby. I'm worried, drinking Blanton's now, that it will be hard to feel as enthusiastic about another bourbon as I do about this whiskey. That said, there are some lovely whiskies lined up on my shelf -- EC12, Wild Turkey, and the entire Four Roses line -- and a lot of them should offer some nice alternatives. Especially when it comes to the nose -- as I finished the last few drops, I can't help but notice how I quickly skip past nosing the whiskey (normally one of my favorite parts of the drinking experience) and just jump to the finish. I do have to say that's a clever way to get me to down my drink quick. The Derby of Bourbons, 20 bourbons at 3030, is on October 3rd. This is my whiskey for Sept 11. Had a conversation with a customer tonight about how the only bourbon he drank regularly was Woodford, because it was easy to drink. The Woodford distillery -- a gorgeous tourist destination, but only partially a working distillery -- is within 25 miles from my parent's house, so I always bring folks who are visiting there. I've been almost 10 times, which is weird considering how little Woodford I actually drink. It's certainly not a bad whiskey, but tasting it today, it doesn't taste so much like bourbon. Not sure if my tastebuds are incorrectly attuned to bourbon these days, but it really tastes like an irish whiskey crossed with bourbon. Maybe my brain is deceitful; it knows that about half the whiskey going in that pretty little bottle is from a pot still, just like Redbreast. This bottle is mild; the taste and mouthfeel is different than most bourbons-- thick and oily, like a corny baby Redbreast. The finish has some nice spice interplay, but not near what the best wheaters can have. The rye is more or less lost, and the taste is just sweet corn and vanilla; most bourbons have those as notes, but this is ramped up. It's certainly a whiskey for people who don't like complications or corner cases. No sharp edges on the taste, no harsh burn; it has a lengthier finish than, say, Maker's, but even that is mild and agreeable. Further into the glass and I'm actually less interested in it -- it's drinkable but not much else, like drinking syrupy soda. I can definitely see why Brown-Forman slap it up as the premium bourbon to sit alongside their Jack Daniels line; it's more interesting than the too-smooth Daniels, but it's smooth and easygoing in its own way. I need to pick something more interesting tomorrow. Maybe Wathen's or Van Winkle 10? Certainly don't regret drinking this, but I do regret the lateness of the hour. To bed! Been a while since I drank bourbon. I've certainly had a slug here or there (feel dirty calling it a "dram"), but the last year has seen me drink less bourbon than I have in a decade, due to learning about beer and cocktails and all that fun jazz. So, a few whiskeys a week, to re-orient my tastebuds. I'm actually going to aim for one a day, to lead up to Toronto Bourbon Week. First off is Jim Beam White Label. Figured it would be an appropriate starting point, as it's most folks' starting point with bourbon. I don't get the nuances I used to, which makes me trying whiskey all the more important. Still, that corn-y-ness, the raw cornbread and yeast Jim Beam flavor is still there, and makes that first sip a little tough. It's watery, too, lacking the viscous mouthfeel and complex flavors of the amaros and such I've been drinking recently. The finish is a bit unpleasant for a bourbon -- not bad, mind you, and certainly nowhere near harsh, but thin and not too exciting. That said, I can see why this was the fancy step up from Kentucky Tavern for me a decade ago; its harshness is a mild, rounded back of the mouth sort, the kind that doesn't gag. I find I let my mouth open for oxygen more to let the taste escape. There's some acidity on the sides of the back and tip of the tongue. It's certainly more sippable as the pour opens up and I'm ten minutes in; the sweetness comes through, and it's not wholly drowned in ethanol. Still, you can barely taste it as a rye-flavoured whiskey; 80 proof probably cuts back on the intensity a bit much. Not sure what I would do with it in a drink; feels like it would get lost. On the rocks, I recall, it tastes like the dirty-but-an-institution bars you go to see grungy bands at; Black Cat in DC, the Dame in Lexington, Little Brothers in Columbus, hell, even Lee's Palace here in Toronto. Watery whiskey that is made inoffensive by the cold, then you chew on the whiskey-flavored ice to hydrate and save money on buying another. Corn-water-with a little finish, so you know you're drinking bourbon. Jim Beam. You ain't bad but sure you ain't any good. Yeah, gave it another try. Still not a huge fan, and it's not cheap. 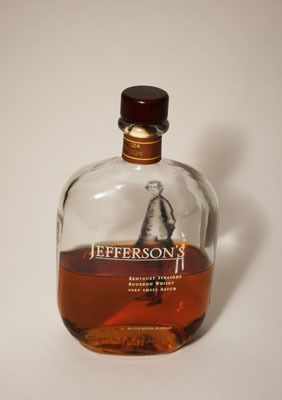 Thomas Jefferson HATED whiskey, by the by, and thought it would be the downfall of a nation. He was super into wine and grumpy when he couldn't get his favorite vines to grow in the Americas. Maybe this whiskey was why? Oily, light, burnt, a little chemical, a little sulfurous. Value -- Nice bottle. Poor.